Rainwater harvesting is a way of saving the rainwater which would normally flow off a roof and down the drain, and recycling it to use it in toilets, for gardening, watering the lawn, and washing your car, instead of treated drinking (potable) water. Is rainwater harvesting suitable for work as well as at home? Yes, in schools, hospitals, offices, commercial premises, rainwater can typically be used for toilets, vehicle washing, watering the lawn and watering gardens. How much water can a RAINGODDESS™ system save? Rainwater harvesting can save the average household about 1,300 gallons of water over the course of a typical summer, according to the Environmental Protection Agency. With a RAINGODDESS™ system, you can use the water to irrigate the lawn, wash your car and water your landscaping. This saves more pure drinking water for cooking and bathing and lowers your water bill. 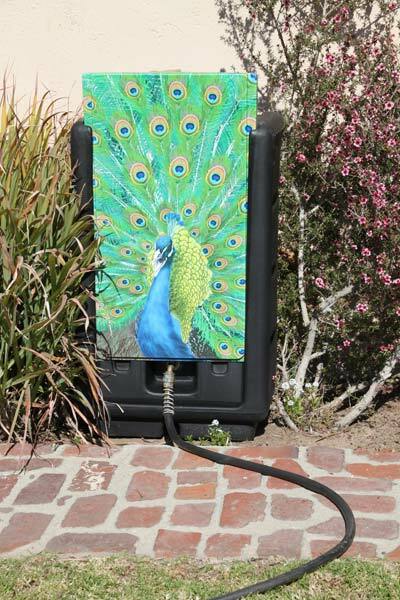 A RAINGODDESS™ system usually ranges from 50 to 80 gallons and has a spigot for filling watering cans and a connection for a soaker hose. Filtered, untreated rainwater should only be used for non- drinking or bathing purposes: toilet flushing, gardens and vehicles or watering the lawn. No, it can be installed in existing buildings. No, RAINGODDESS™ systems can be used at businesses, schools, and more. So, why should people buy a RAINGODDESS™ rainwater capture system? To save on water bills and to use a precious resource responsibly to make a difference in our environment. Rainwater can be wonderfully pure when it falls through unpolluted air directly into a clean, properly constructed container. The rain that falls in cities or flows across outdoor basins, roofs and other open air surfaces on its way to a barrel is another story. Contamination from animal feces, dead insects, engine oil, car exhaust, lead paint and other substances can make drinking it a health hazard. RAINGODDESS™ doesn’t recommend that you drink the water captured in your system.